The ever popular island of Bali nestles between Java and Lombok in the Indonesian archipelago. With the perfect blend of stunning backdrops, warm locals and exquisite beaches, it’s a true paradise on earth. However, Bali offers much more than great surfing and luxury resorts. At any moment, you’re likely to spot stunning sculptures of Hindu deities or a wonderful courtyard. The small religious offerings known as ‘canang sari’ are sure to catch your eye as well. These leaf trays are made daily and are found on every doorstep. They’re usually full of colourful flowers and aromatic incense, which add to the tranquil atmosphere that makes Bali so appealing. Whilst Kuta on the south coast is a tourist haven, with its western-orientated bars, the foothill town of Ubud to the north is the cultural hub. The awe-inspiring rice fields, sacred forests and historic monuments give you a true sense of Balinese life. One of Ubud’s most popular attractions is the sacred monkey forest. Inside are over six hundred mischievous Macaques, who won’t hesitate to climb on your arm in search of bananas. Also, hidden amongst the trees are three magnificent temples, dating back to the 14th Century. 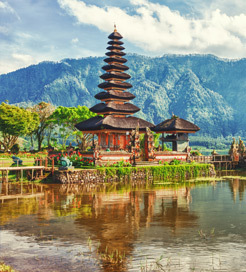 There are over 20,000 temples, known as ‘pura’, in Bali, with certain laws requiring every town to build at least three. Pura Taman Saraswati, just north of Ubud, is one of the most beautiful. It is surrounded by gorgeous water features and displays intricate carvings of Dewi Saraswati, the Hindu goddess of the arts. Pura Luhur Ulu Watu on the south coast is also worth seeing. It offers sublime coastal views and often hosts performances of the spectacular ‘Kecak’ dance, which involves up to 250 dancers chanting in concentric circles. There are a number of ferry routes to Bali, all of which dock in Padang Bai on the south-east coast and Serangang on the south-central coast, near Kuta. There are departure points in Teluk Kode on Lombok’s west coast, Gili Trawangan and Gili Air. These journeys are operated by Bluewater Express, who provides high-speed services every day. For more information, please visit our Ferries from Indonesia to Bali page. For more information, please visit our Ferries from Gili Islands to Bali page. For more information, please visit our Ferries from Lombok to Bali page.